⦁ 1 - Crimson is Born. Hurakan created the starseed species but she never fashioned any of them after herself or gave them any of her genetics. Crimson was created to act as a sort of time capsule. While she would gain some of her mother's abilities, most of Hurakan's power would be repressed. If she had created a daughter in her image, this daughter would have the same abilities paired with the same evil that took Hurakan a thousand years to control and overcome. She feared that all of her life's work would be ruined if she unleashed another like herself into the world. Crimson was responsible for passing on Hurakan's genes to an heir; to start a line of her direct descendants who would rule over her kingdom forever. ⦁ 2 - Crimson grows extremely fast and is already full grown by two. Hurakan gradually passes on all of her memories and knowledge to Crimson who was designed to be able to remember and apply anything she's taught and everything she sees, hears and experiences. ⦁ 6 - Hurakan finishes passing on knowlege about starseeds, herbs, medicine, fighting, all of her memories, the earth, history, humans, and everything else she has experienced. ⦁ 8 - Crimson struggles with her identity and shares with her mother that other wolves were doubting that she was worthy of leading the kingdom. Hurakan shows her the plan that is set in place for her life. Crimson gains a new sense of purpose. ⦁ 10 - Crimson gains the respect of many as she cares for the packs health and needs. She starts to develop relationships with everyone in her mother's kingdom. ⦁ 12 - Crimson is exposed to a lot of scary things that she must protect the pack from. It's one thing to know about something and another to live it. ⦁ 13 - Crimson gets strong and masters her abilities. ⦁ 20 - Crimson meets her betrothed Dusk. He was from a distinguished line and Hurakan had hand picked him for her daughter. He was only a year old when they met and his family gave him to Hurakan to raise to maturity. ⦁ 22 - Hurakan is pleased with who Crimson has grown to be and decides to depart from this earth. She teaches Crimson how to depart so she can too when she is finished with her duties on earth and promises she'll be waiting for her when that time comes. ⦁ 24 - Dusk and Crimson become mates. They had grown very close and were in love. It was a happy day for them. ⦁ 28 - Crimson's pups were born too late and die. ⦁ Ivy, age 3, joins the pack despite being a loner at heart. She and Crimson were best friends and Ivy only agreed to be part the pack after Crimson had taken over. She decided to stay after hearing about Crimson's pups and is ranked as a Beta. ⦁ Iced Earth, age 4, joins the pack. He spent his early years as a solitary nomadic mercenary. He was hired to kill someone's brother, a rogue, who turned out to be more than Iced could handle. Dusk saves his life and offers him a home and family. He is ranked as Head Guardian. ⦁ Hurakan and Reaper's original kingdom had grown fruitless after the sudden loss of Hurakan's magic that had been sustaining it. Crimson, despite being heart broken about her pups, decides to migrate the pack elsewhere to give the land time to readjust and huntable game to replenish. ⦁ Lost many of the older members along the way. When they found an area they liked they easily overthrew and ran off the wolves that lived there with a peaceful but immense show of power. They claimed the territory for themselves. Crimson decided to live in the heart of her new land and instructed a few of the mated pairs to branch off and start packs in surrounding areas. ⦁ 29 - Reaper dies at 20. She is usually reincarnated within the first couple days after she dies within the pack or close by but no one reported her birth. ⦁ Crimson's composure crumbled. She hadn't given herself any time to mourn her loss, she was exhausted by the journey and her heart was heavy from the deaths of her mother and pack members. Now Reaper was missing. Crimson became distant, spending most her time in the dens. Dusk trained the new members flocking to the territory. The news of a powerful pack taking over a large territory spread very quickly. Many wanted to be a part of it. Crimson was supposed to be in charge of screening them for pure intentions but she no longer had the will. Dusk couldn't even pull her out of her depression. ⦁ News of a large, powerful pack ariving from the birthplace of their species spread quickly. Many new members joined the pack. Crimson was incharge of screening new members to insure pure intentions but her depression kept her from preforming these duties. ⦁ The new comer is revealed to have been sent by rivals as a spy while the pack was weak from losing their matriarch, beta female matriarch and the alpha female being grief stricken. Dusk had persuaded Crimson to go for a walk with him. There was an ambush and Dusk was killed. Crimson was injured and forced to watch to further weaken her mind. The spy and rival pack underestimated the forces that stood behind Crimson. The pack's guardians came too late to save Dusk but ran them off, killing a few, but returned to help Crimson and form a protective perimeter around the rest of the pack. The enemy disappeared. ⦁ After she healed, Crimson leaves Ivy and Iced Earth in charge while she goes on her coming of age journey she had put off to mourn Dusk, learn to live without a pack, develop her abilities and become generally stronger at age 29. ⦁ 31 - Crimson comes back at age 31. While she was away she found Reaper who had been reincarnated very far away and was still too young to travel or use her abilities. Crimson stole her from the family she'd been born to and raised her. She was two upon their return. VX was 8 and had to get used to her mother being physically younger and smaller than her. ⦁ 32 - Chemical came to the pack as a loner at age 4. He had lost his pack as a young pup and was raised by a group of nomadic earthly wolves. He only stayed with them until he reached adulthood and then he went out in search of others like him. He was ranked as a scout. ⦁ 33 - Burn proves to be a less than exemplary alpha, disappears one day. It is rumored that Crimson killed him but no one knows for sure. She only ever seemed to tolerate him. He was away a lot and Crimson never mated with him. Crimson leads alone now and pack life continues peacefully for another 4 years. ⦁ 34 - Humans begin to pose a threat on the territory with hunting. ⦁ 35 - The pack is forced to kill many hunters. ⦁ 36 - Reaper and a few others worked to create a glamour around the territory that stops humans from being able to enter. This made the wild life population increase which, in turn, provided more food and allowed Crimson to increase pack numbers and allow reproduction within all branches of the pack. ⦁ They saved Khalypso, age 2, who was captured by a human hunting party and allowed her to join the pack. ⦁ 37 - Crimson takes reaper as a mate. ⦁ 38 - Ivy and Iced Earth (13, 14) become mates and have 3 pups: Sage, Azalea and Drake. ⦁ Chemical and Khalypso (8, 4) become mates and have 5 pups: Blue, Kenai, Dex, Zula and Thyme. ⦁ After a year of being with Crimson, Reaper decides to have her second pup Cyan. ⦁ Lightning, Dusk's half brother, joins the pack when he is 8. He had been searching for the pack since he found out he had a brother who had been mated to the daughter of Hurakan. ⦁ 39 - Crimson's relationship with Reaper began to fade into a close friendship while Reaper was busy raising Cyan. Reaper, being the wolf she is, only had so much room in her heart for love. Crimson continued to love Reaper and helped raise her pup. ⦁ Lightning starts to pursue Crimson's affection. She pushed him away for a year hoping Reaper would come back to her. ⦁ 40 - Crimson finally let Lightning in after she accepted her romantic relationship with Reaper had ended. ⦁ 41 - Lightning and Crimson courted and had pups together after another year when she was sure he would be a reliable father. She refused to rank him as an alpha but they had five pups. Fallen Leaf, Xania, Kaline, Rune and Zephyrine. ⦁ Shortly after Crimson's pups were born the pack's hunters started to be attacked during hunts. A couple scouts were killed during their rounds too. The wolves attacking them seemed to be able to evade any attempts at tracking them, supernatural or not. After each attack they would simply vanish. ⦁ 43 - VX dies at 20. To Reaper's surprise, VX was reincarnated to a mated pair who lived close by in a sister pack. They brought her to Crimson, recognizing her distinct black and red coloring, thinking it was Reaper. ⦁ Reaper has her third pup Ricin after VX was reincarnated so they could be raised together. She wasn't worried about her children's safety, confident in her ability to protect them. Crimson on the other hand was worried and started her pup's training as soon as they could walk. ⦁ Rune was strong and a gifted fighter but he wasn't born with any remarkable supernatural abilities. He was ranked as a hunter. ⦁ Kaline was always the sweet one and had exceptional speed, empathy and telepathy. But, despite vigorous training, she could never bring herself to kill or fight. She was ranked as the pack's den mother at age 3. Two highly gifted guardians stayed with her and the pack's pups at all times. ⦁ Fallen Leaf matured very quickly and was very powerful. She was trained and ranked as head scout at age 3. ⦁ Xania matures and is offered a head guardian rank at age three. Leading anything didn't appeal to her so she was ranked as a guardian. ⦁ Zephyrine proves to be the proper heir and most clear descendant of Hurakan, being born with abnormalities and gifts. She was born with her eyes open and was full grown at six months. For the first two years of her life she was ranked as a hunter so she could get strong and agile. Once her brother and sisters were trained and ranked Crimson separated her from the pack and started training her to be a guardian. She is forced to keep a very secluded life despite being surrounded by pack mates and comrades. In addition to her combat training she was starting some lessons preparing her to be the next alpha. Her mother forbids her to take a mate or even stray to far from her side. She is instructed to remain aloof, elegant and unreadable by Crimson. She obeys. Within the next year she is ranked as head guardian. ⦁ 44 - The attacks on Crimson's pack members continued to occur and their severity was increasing. ⦁ Khalypso was part coyote and this unfortunately shortened her life span considerably. She dies at age 10 from old age. ⦁ 45 - Crimson tries different methods to stop the attacks but is unable to. She ranks a few guards, who are usually more powerful, as scouts and the attacks happen less frequently. Crimson's new scouts are even able to kill a couple of the attackers. ⦁ 46 - Damien joins the pack after being referred by one of the it's sister packs due to having information about the attacks. He had defected from the enemy pack and revealed that it was the pack responsible for killing Dusk. They had been growing stronger, increasing their numbers and recruiting members with powers conducive to tracking evasion and other abilities that would counter anything Crimson's pack could throw at them. They wanted her territory because they were made up of the wolves that she and her pack had overthrown to get it. They had generations that were taught to hate Crimson's pack since they were born. Their numbers were now as great as as all of Crimson's pack and their sister packs combined. They had nomadic groups surrounding the land that used to belong to them. The attacks on Crimson's pack were to start thinning out their population. The enemy also hoped to reduce the amount of food they could bring in by killing off Crimson's hunters. ⦁ Damien said her pack had been named "BloodClaw" by the enemy to further depict a clan of ruthless, murdering, thieves. 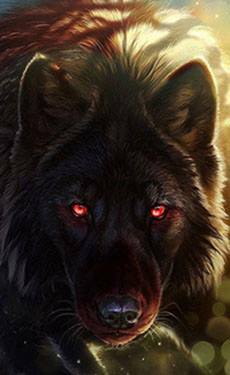 The lies they would tell to gain sympathetic followers often ended in the teeth and claws of Crimson's pack "dripping with the blood of the innocents." ⦁ It had been Crimson's obsession to find the wolves that killed Dusk since they had disappeared. Now she finds out they had been multiplying like cockroaches right under her nose. She stops Zephyrine's training and all other pack life to confirm Damien's information. Once confirmed, she leads her pack into war, changing it's name to BloodClaw. ⦁ All of the sister packs joined the war under the BloodClaw name. With Damien's help they learned the patterns of the enemy and quickly formed a combat style and effective strategies. ⦁ The packs alphas and highest ranking members were promoted to warriors and their population was split into divisions. Fallen Leaf was one of the wolves who was promoted. ⦁ Xania stays behind temporarily to have pups, fearing she wouldn't get the chance if she died in the war. She had five pups: Aaron, Zane, Thorn, Tove, Nerissa. Her pups were left with Kaline when she rendezvoused with her mother and the rest of the pack 1 year after the war had begun. ⦁ 47 - The war started out slow but once the enemy pack realized that Bloodclaw had figured out their patterns they decided it was pointless to keep running. The battles became more strategized, more direct, more frequent and more bloody. ⦁ 48 - Utsuro, a loner, joins the pack and war at age 5, two years after it had started. He had heard stories while he wandered the lands and joined "for the hell of it". He was placed in Fallen Leaf's division. ⦁ Chemical is injured in battle but is too old to fully recover. He leaves the battle field to die at age 18. ⦁ 49 - Zephyrine was promoted to warrior after 3 years of fighting at Crimson's side. Xania replaced her as head guard of Crimson's division. They had gotten news that a large number of the enemy pack was planning to ambush Reaper's division. Reaper was very close to her death day and Zephyrine was ordered to take a group of wolves with her to add to that division to make up for the power they'd loose when Reaper died. Her assignment was to take over as the leader of Reaper's division and find her when she is reincarnated before the enemy did. VX, Ricin and Cyan were also in this division. ⦁ Zephyrine and her division successfully defeated the group they were ordered to intercept and found Reaper before she was killed. They moved to the outskirts of the war grounds and were forced to limit travel for a year while Reaper grew. They fought to protect her at all costs, only moving when the main body of the war got too close. ⦁ The war continued and many lives were lost. It was spread out over hundreds of miles due to the nomadic nature of the enemy pack. [Location] was mostly wilderness and the glamour to hide them from the rest of the world was extended throughout so humans were not an issue. Back home Kaline has met and mated with a male named Zion. They had four pups - Shira, Primrose, Nadira, Darius. ⦁ 50 - Zephyrine's division fought many battles all on their own, separated from the rest of the pack. When Reaper was old enough to fight and use her abilities again they returned to the front lines. It was another 2 years before they crossed paths with Crimson's division again. ⦁ 51 - Xania was killed during a battle while healing her son Thorn. She healed him in time and he killed the wolf who had killed his mother. ⦁ 52 - Lightning is 22 and elderly. Crimson begs him to leave the war and wait for her somewhere safe until she can come to him. He refuses, his pride too big to admit he was too old to fight. He was killed during a battle after he reached a point of exhaustion that made him unable to stand and fight back. ⦁ 53 - It was early spring and there was an almost constant drizzle of rain and layer of grey clouds dulling the bright colors of of the waking forest flora. The war had been raging six years and BloodClaw had taken a significant lead. Their wolves were stronger, bigger and more powerful. Their bloodline was rarely mixed with earthly wolves and most of them were born in the Starseed homeland, descended from the first wolves that Hurakan created thousands of years ago. ​The enemy pack's numbers were estimated to be below 50 now. The area the war covered had been reduced to a mere fraction of the size it was when the war began. Most of the enemy's cloakers and more powerful wolves had been eradicated and a many of the wolves that remained were trying to run. Crimson wouldn't stop until every last wolf of the enemy pack was dead. She let them escape once it lead them here. ⦁ When Crimson and Zephyrine had time to discuss the last three years, Crimson woefully informed her daughter that Xania had been killed not long after she'd left. Kaline had died defending the pups during an enemy attack. Her father, Lightning, had died from continuing to fight despite his old age. ⦁ "The pain and regret she felt drowned out the joy Zephyrine felt to see her mother again. It made her realize how tired she was and how little time she actually got to spend with her sisters. She loved her father. He had always been there to reassure her when she started to doubt her mother's methods. Xania was one of the only wolves she had a relationship with other than Crimson before the war. Her sorrow was soon replaced with rage, burning hatred and resentment coursed through her veins. Her fur started sparking and smoking until it burst into flames. The soft grey lighting darkened and wispy rain clouds billowed into ominous black sails dragging roaring thunder and writhing lightning in their wake. Wind screamed through the trees as waves of terror washed over Zephyrine. Her thoughts erupted into concerned and frightened voices, her mind's eye flooded with aerial views and flashes of light. The spit and hiss of heavy raindrops hitting the fire that engulfed her body stung her ears. She screamed, her eyes tightly clamped shut, she felt the flame's heat but it was not burning her. The voices got louder and the images brighter. She could hear her mother's voice saying her name distantly mixed in with all of the other sounds. Zephyrine cried out to her, pleading for help. Crimson's voice came through again, clearer this time. "Zephyrine.. Stop." A cool, tingling sensation seeped into the edges of her hysteria. The images and other voices faded and she heard her mother's calm voice again; closer, clearer. "Stop..." The tingling spread throughout her, cooling her fur and dissolving the remaining whispers and scenes in her mind until it flowed from her eyes. "There, there, my girl. Shhhh..." She opened her eyes, looking up at Crimson through blurry tears. The grumbling clouds were retreating toward the horizon with the thunder lazily rolling along behind them. She had collapsed at some point and her mother was curled around her, their concerned division's huddled around them. The ground was scorched and smoldering beneath them. As she let her eyes wander further, she saw other areas with the same smoking, black wound." ⦁ The rest of Zephyrine's abilities had been triggered by her emotions. Until that moment she had viewed the war as a job, her duty, and nothing more. Over the next few months she learned how to harness her power. When was ready she rained fire onto her family's remaining enemies, ending the war and avenging her sister, Dusk and the rest of the fallen within a few hours. ⦁ The war is won after 6 years. Zephyrine is given the name Shona-Shikha and Crimson is given the name BloodClaw. ⦁ Crimson expands her pack lands, again taking over what the losing pack once ruled. ⦁ Crimson resumes Shikha's training. She developed her abilities and learned how to control them. For a while whenever she felt strong emotion such as anger, sadness, agitation or regret she would just burst into flames. It was a real problem. She struggled with PTSD after the war. Her nightmares and flash backs would usually result in an entire area and anyone in it bursting to flames. So Crimson was the only one allowed near her for quite a while. Shikha was struggling with seeing everyone she knew and loved growing old and dying while she stayed the same. Her remaining siblings were noticing it too. Crimson comforted them and told them it gets easier to deal with but they'll never truly be used to it. She was unsure when they would naturally die, knowing only Shikha would have a choice in the matter. For now, none of them showed any signs of aging. At 12 years old, none of them had aged a day since they turned 3. ⦁ The pack returns to it's structure of main pack and sister packs. ⦁ Rune is sent out to start a new pack in the expanded territory. Three mated pairs were sent with him. Once they arrive there he meets a female earthly wolf. She had a starseed in her distant relatives so she had the sentience to have a name and understand speech. Her name was Aurora and she was 2 years old. She was very intelligent, sweet and kept up with the starseeds well. Rune took her as his mate, despite Crimson's objections. ⦁ Xania's pups are now 7 years old. They, too, stopped aging after 3. ⦁ Kaline had died protecting her pups. The guardians with her were able to defeat the group that attacked them at the dens but they got there too late for Kaline. Her children survived and were 4 years old now. ⦁ Ivy and Iced Earth had grown old. They both had to leave the war early and held on until they were able to see it end and spend some time with their children. They died shortly after the war ended. Ivy was 28 and Iced Earth was 29, much older than most starseed wolves usually live. ⦁ 54 - Chemical and Khalypso had also grown old. A year after the war eneded they died when Khalypso was 19 and Chemical was 23. ⦁ Utsuro and Fallen Leaf have 4 pups. ⦁ Rune and Aurora had four pups. Crimson strongly disapproved, urging Rune to reconsider but he ignored her. The three mated pairs in their pack also had pups bringing their pack number to 25. ⦁ Ivy and Iced Earth's and Khalypso and Chemical's children were all 15 when the war ended and their parents died. They had all found mates during the war and knew they were running out of time to have families of their own. ⦁ Kenai and Slate have 4 pups. Thyme and Ryker have 3 pups. Zula and Lazarus have 4 pups. ⦁ 55 - Dex and Fleur have 4 pups. ⦁ 56 - Azure and Solomon have 3 pups. Azalea and Judah have 3 pups. ⦁ Shikha's mental state had healed and she had learned to control her abilities. She returned to her rank as Head Guardian. ⦁ Kenai, Ryker and Zula die of old age. ⦁ 57 - Drake and Magdelena have 5 pups. ⦁ Thyme and Lazarus die of old age. ⦁ Crimson decides to change Shikha's rank to scout. They go on rounds together and Crimson teaches her about plants, herbs and animals. She would tell her stories of the pack's history all the way back to the beginning when Hurakan and Reaper first fell to this world and before. They spent hours daily together travelling throughout the territory, through the land that the war had scarred in both of their minds. They cried together and healed together. Crimson told her why she had so little resemblance to Hurakan while Shikha did, evoking a new sense of pride within her. ⦁ 58 - Cyan dies at 20. Reaper has her fourth pup Arsen when Cyan is reincarnated. ⦁ Sage and Rolland have 4 pups. ⦁ Judah, Dex and Slate die of old age. ⦁ 59 - Fallen Leaf doesn't return from her rounds one day. She had insisted on going alone and no one could find her. With her abilities, if she didn't want to be found she wouldn't be. No one believed she had been killed and with Crimson's long life gene she could still be alive. Utsuro and her children, who are 5 now, are heartbroken and wait hopefully for her return. ⦁ Aurora, Rune's mate, dies at age 9. Rune is devastated and comes to his mother to tell her she was right, He should have chosen a starseed mate so he would have had more time with them. Crimson comforts him and apologizes for not approving. She reminds him how much he loved her and that their love made their time together worth it. Rune then tells her that two of his children are already getting grey. He is distraught and Crimson lets him stay with her for the night. ⦁ Azure and Solomon die of old age. ⦁ 60 - Azalea and Fleur die of old age. ⦁ 61 - Rolland dies of old age. ⦁ 62 - Rune's children Bennet and Alaska die of old age. His remaining children, now 10, show no signs of aging and have starseed traits. ⦁ Shikha went on her coming of age journey at age 21. Her mother had gone after Dusk died and felt that it was an important tradition. It symbolized the thousand years Hurakan took to learn to control her destructive urges and evil tendencies. The same chaotic soul lived in the two of them and Crimson didn't truly feel strong until she went on hers. She told Shikha that she had to go alone, that she could not return for at least two years, and not to worry about the pack. Her mother encouraged her to push the limits of her strength and sanity and to see what her abilities could do without restrictions. The journey was to learn about herself and what she was truly capable of. ⦁ 63 - VX and Ricin Die at 20. They're reincarnated shortly after. ⦁ Sage and Utsuro die of old age. ⦁ 64 - Drake dies of old age. ⦁ 65 - Magdelena dies of old age. ⦁ The original 3 mated pairs that were sent with Rune to his new territory die at around 22 from old age. There were 13 pups total from their generation. 6/13 mate and have pups at 14 after their parents die. ⦁ Shikha returns from her journey and Crimson backs off, letting Shikha start to take over some of the Alpha's duties, ranking her as Beta. ⦁ 66 - Shikha finishes her studies and now knows everything that Crimson can teach her. ⦁ 67 - Crimson steps down and ranks herself as an elder. She enjoys her days relaxing and telling stories to everyone in the pack. Shikha starts to integrate the sister packs together again, feeling that the pack is strongest when together like in the war. ⦁ 68 - Shikha takes on new members and begins training them. ⦁ 69 - Reaper dies at 20 and is reincarnated shortly after. ⦁ 8 older members from the second generation of Rune's pack die off. There are now 5 elders in his pack that will die within the next few years. There are 18 pack members in the 3rd generation of his pack who are now 5. ⦁ His two remaining children, now 17, have taken mates within the pack and have pups. Sol has 3 pups, Ophelia has 4 pups. ⦁ 70 - Crimson waits for Reaper to mature and then informs everyone that her time has come. She had completed everything that was planned for her and could see her daughter was ready to lead without help. She said good bye to everyone and asked Shikha to walk with her for a while. They talked, laughed and said their good byes also. Shikha's fur sparked and embers slithered through each strand. Her mother comforted her and told her the last secret there was to tell: Her departure meant she was going to join Hurakan in purgatory where her life would continue. She reassured her that she would still be with her. She told her that whenever she decided that her work was finished, Shikha would join them and told her how. "You'll know when it is your time, my child." She whispered. They nuzzled each other and Crimson wandered into her territory for the last time to die, as beautiful and young as the first time she entered it. Shikha fully takes over the pack and integrates all of the surrounding packs together. She keeps Reaper as her second in command and renames the pack to Pyregalvanic. Her decision to return the pack to their sacred homeland starts the next chapter of this story. ​Shikha is 29 - Reaper is 1 in her 104th incarnation - VX is 7 in her third incarnation - Cyan is 12 in her second incarnation - Ricin is 7 in her second incarnation - Arsen is 12 in her first incarnation - Xania's children are 24 - Kaline's children are 21 - Fallen Leaf's children are 16 - Sage and Rolland's children are 12 - Azalea and Judah's children are 14 - Drake and Magdalena's children are 13 - Azure and Solomon's children are 17 - Kenai and Slate's children are 16 - Dex and Fleur's children are 15 - Thyme and Ryker's children are 16 - Lazerus and Zula's children are 16 - Rune is 29 - Rune's children are 17 - Rune's five pack elders are 19 - Rune's eighteen pack members are 5 - Rune's grandchildren are 1. Lightning was Dusk's half brother. His family line was descended from one of the first of Tikaani's starseed wolves. His mother was chosen by Tikaani to mate with a male of her choosing to produce the perfect mate for Crimson. After Dusk was born, his mother went back to her life and mate. Later, she had Lightning and his siblings. When he found out he had a brother who was mated to the daughter of Tikaani, he searched for him. Lightning joined Crimson's pack when he was 8. Three years later he and Crimson became mates and had pups but he never became alpha. Appearance: White fur and blue eyes. Stood at 5 feet tall. Crimson was Tikaani's only daughter. She had taken care of the pack since age 9 and leading it since she was 18. In her 52 years of ruling she lead a large migration that was responsible for spreading the starseed species to the United States and Canada. Her pack taught healing and magic to many and triumphed in a great war. Appearance: Black fur, green eyes, standing at about 5 feet tall. Reaper is matriarch of the Starseed bloodline. She was born of chaos in purgatory. When her and Tikaani fell she was trapped on earth, cursed to be reincarnated over and over with intact memories and personality. She will never be able to return to purgatory. Her incarnations are 20 years long and her parents have nothing to do with her physical appearance. Xania was born to Crimson and Lightning. She had exceptional abilities and was skilled in combat. She was offered the rank of head guardian at a very young age but refused it. She was as humble and kind. Before the war had officially started, Xania knew it would be a bloody one. She was unsure if she would survive. She had always wanted pups but was worried she wouldn't get the chance. Not wanting to tie herself to a proper mate, she found a random earthly male and seduced him. The pups were born shortly before the war started and they were left with Kaline. Xania died in the war while healing her injured son, three years after the war started. Appearance: Black fur with blue markings and blue eyes. Stood at 5ft tall. Kaline was another one of Crimson's daughters. She was a tender soul, sweet and gentle. When the war started she was left at the dens to care for the family's pups. During this time she was courted by a male named Zion. They became mates and had pups. Zion was unable to stay and Kaline refused to leave with him. They never saw each other again. There was an enemy attack on the dens. Kaline fought bravely to defend her, and everyone else's, pups. She gave her life protecting them. Appearance: Silver, white and dark grey fur with amber markings. Amber eyes, 5ft tall. ​Soft spoken, kind, gentle. Zion's abilities made it almost painful to be around anyone. Kaline's abilities made her able to interact with him comfortably. Unfortunately, Kaline was rarely alone. He was sure she'd leave with him. He was wrong. He was a scavenger and nonverbal by choice. ​Utsuro came to the pack two years after the war started. He was a loner rouge who had heard of the war during his travels. He joined the fighting for the hell of it. He had run into some members of BloodClaw and felt they were worthy of his time. He was placed in Fallen Leaf's division and quickly climbed the ranks. Before long he was her equal and they lead together, fearsome and powerful. They became mates after the war and had a family. Appearance: Muscular and tall, Black fur, shorter tail, one silver ear, silver eyes, 5ft tall. Appearance: Long gray, black, brown fur, gold markings, orange eyes. Slender, athletic build, 5ft tall. Born to Crimson and Lighting, Rune was strong, gifted in combat and dominant but lacked any remarkable supernatural abilities. After the war he was sent out to start his own pack on the other side of the mountains overlooking his mother's territory. ​Appearance: Thick white fur and blue eyes. Large paws and a strong build. Stood at 5 feet tall. Family Trait: Coloring, long life, detailed memory, recessed starseed genes form mother, father and grandmother. ​Aurora was an earthly timber wolf who lived in the area Rune took over. She was a fierce hunter and a loving mother. Despite her earthly origins, she kept up with the starseeds well and made her place in their family. ​She was able to talk a little, give herself a name and learn more than average earthly wolves because there was one starseed in her blood line generations ago. Appearance: Earthly timber wolf, mainly grey and white with brown under tones and golden eyes. Family Trait: Coloring, Some recessed starseed genes. Abilities: Sentience and higher intelligence than earthly wolves because of a distant starseed grandparent. Ivy lived in the same area as Crimson's family while they were growing up. She and Crimson were best friends. Ivy was a loner at heart but agreed to join the pack after Crimson took over and became beta. She fought in the war with her mate but they both had to leave the war early due to age. They held on until they were able to see it end and they could spend some time with their children. They died shortly after the war ended, living much longer than most starseed wolves. Iced spent his early years as a solitary, nomadic mercenary. He was hired to kill someone's brother, a real piece of work, who turned out to be more than Iced could handle. They were fighting, Iced was losing, and Dusk heard the commotion. He joined the fight saved Iced Earth's life. After, he offered him a home and family, a way out of the life he was living. Iced accepted, becoming a head guardian to the pack and best friend to Dusk. ​Khalypso was caught by humans as a pup and raised as a fighting dog. Her handler betrayed her, deciding he would sell her to an animal testing facility that had offered him a huge amount of money. Crimson and the pack received word about a Starseed being kept as a pet and decided to investigate. When they got there, they were horrified by how she was treated and mounted a bloody rescue. There were no survivors. Khalypso was given a home with the pack. Chemical came to the pack as a loner. He had lost his pack as a young pup and was raised by a group of nomadic earthly wolves. He only stayed with them until he reached adulthood and then he went out in search of others like him. 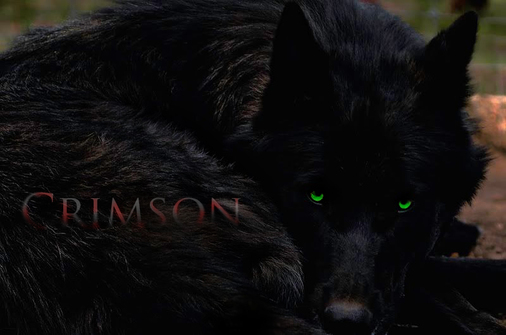 Crimson found him near her territory and took him in, ranked him as a scout and eventually him and Khalypso were mated. Appearance: Medium build, standing at 4 feet tall, Gray-ish green, thick fur with brown eyes.